One of the first things we did when we moved to the Crossroads two years ago was to screen the front porch. It was just a concrete porch, and we made an effort to make it comfortable and livable. Since our home is old and the porch had been enlarged at some point, the concrete floor was unlevel. So we found an outdoor carpet that went with the furniture we already had. For the past two years, we have left the porch the way it was since we moved here. But this spring, we decided that we needed to do a little refreshing by adding more color. and here you can see the other end. And what can be more refreshing than watermelon on a hot summer day! This table used to be in the kitchen in our other house. 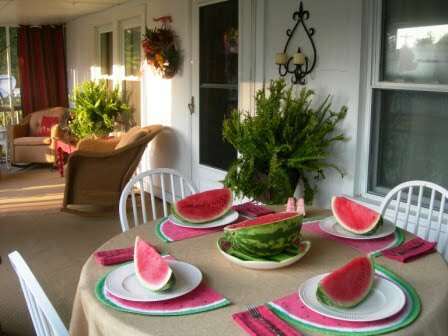 We use it out here because we like to eat on the porch when the weather is nice. The color scheme on the porch has just sort of evolved as I have added a few items. I ordered these petite sized cushions from Ballards about a year ago. This rug, which is dark brown with red flowers, was purchased two years ago. You can see similar colors in this pillow I bought the same day I got the rug. So the whole color scheme came together with these drapes. I can’t believe I found some with just the right colors. 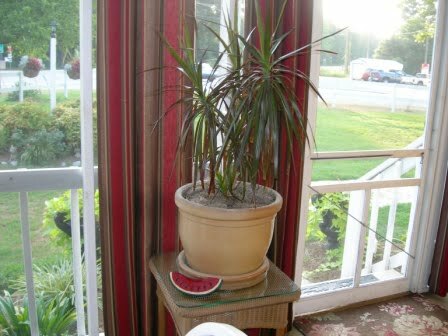 By the way, the plant is on a table because our dog Lucy likes to dig in it. Our porch faces the west in the afternoon. Between the hours of 4 to 6, we could not use the porch in the afternoon because of the sun. We desperately needed something to control the sun so I decided on some outdoor curtains. But have you priced outdoor curtains? I found these at JC Penney’s. 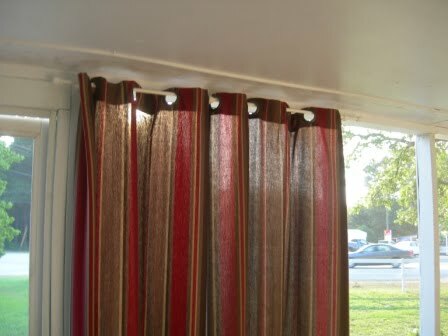 They are not outdoor curtains. They are unlined. They will probably fade. I don’t care. I got a bargain on them. I only paid $7 for some of them and $6 for the rest. So at this price, I can replace them. And we love them. They make such a huge difference in our porch. Now it feels like a room and the curtains give us a little privacy. Once we got the curtains, Leo found this cute pillow at Lowe’s. And Rascal has found a comfortable place to snooze. 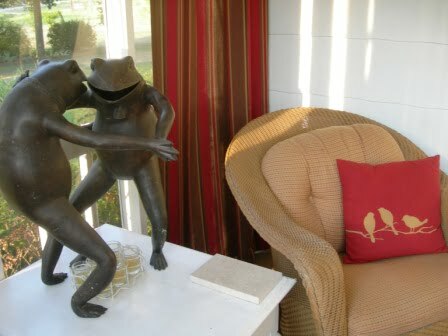 The dancing frogs we’ve had a long time. Leo’s son, David, gave them to us. We’ve had this little planter for many years. It just gets filled with some new ivy each year. I do not have much luck with ivy but I love it so. This planter is probably about 12 years old. I just replace the flowers each year. 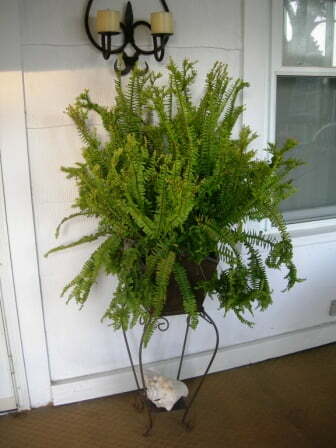 The ferns that I use on the porch are called Petticoat ferns. I had never seen them before this year. I got them from Jay’s Trading Post across the street. This old window we used in our other house. Same with the wire plant holder. 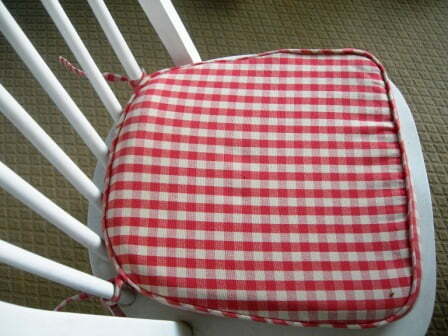 We’ve had this rocker a long time. I think it’s been 4 different colors through the years. 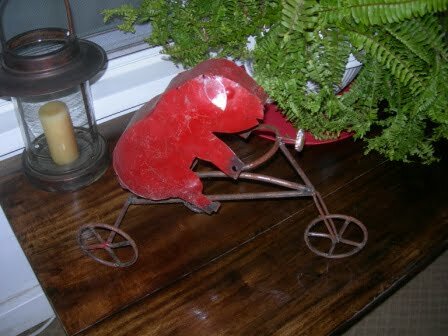 This little racing pig is on the table that I recently re-stained and painted. 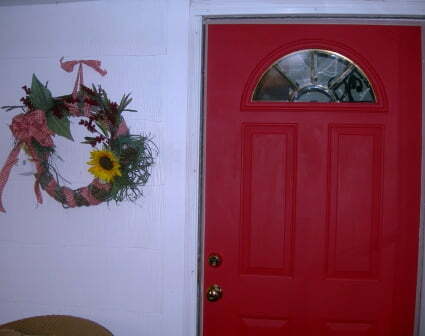 Here is the wreath I made beside the newly painted front door. I’m loving that red door. Really adds more color to the porch. I’m going to put the word WELCOME in vinyl letters on the door. 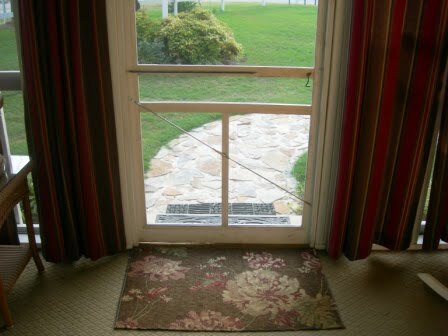 Right now we have a storm door in front of the other door. We aren’t sure if we want to remove it or replace it. Lucy approves of the refreshing that we did on our porch. And I’ll leave you with a few more pictures of that juicy watermelon. 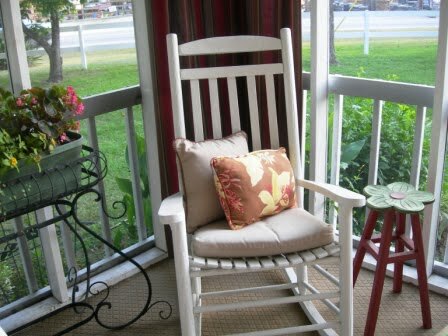 Come see some other porches and patios by clicking here. Leo and Lucy make your porch a home worth living in. What a nice and lovely place!! You guys did a perfect job! And your pets are adorable! Kisses from Brazil! I have a front porch smaller but similar to yours. I’d like make mine more comforting I have a small couch there and a round table and two chairs. I’m going to paint and add curtains or shades. This is a question I’d like to ask of you…what about when there is a bad storm or rain blowing from a bad position so as to soak your porch? I see that there is “outdoor carpet” am I correct on that? Please share any pointers for me if you will.. my porch is flush with the ground but looks like yours rather it is “built” like yours. Love your porch and its updates. The curtains add so much warmth along with privacy. 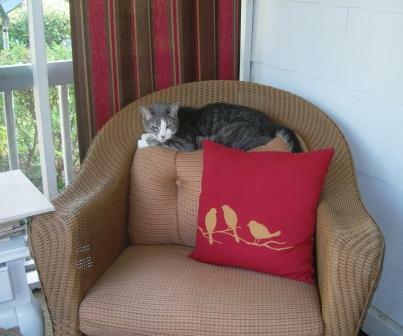 It makes the space feel so cozy … and clearly Rascal agrees! What a great porch! I am still dreaming, but I am certainly gathering ideas from good ones like this. 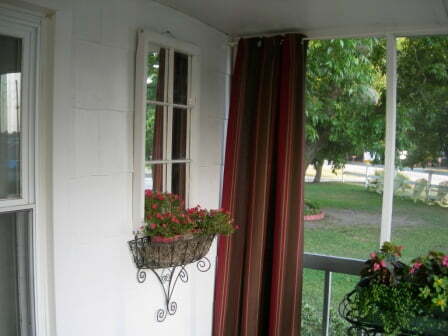 Jane…love your front porch…I am contemplating placing drapes on mine too….actually my hubby saw some in our neighborhood and commented that he really liked them…so I shall run with it!! You know, “strike while the iron is hot”! 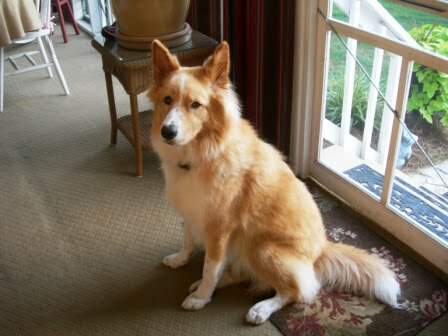 !….Beautiful, beautiful porch Jane…I am sure you and Leo love spending time out there!! Visiting from DebbiDo’s. Lovely site! Your home looks so inviting. I know you so enjoy living there. I have signed up for email updates. Visiting from DebbiDo’s. Lovely sit! Your home looks so inviting. I know you so enjoy living there. OH goodness Jane that watermelon is making my hungry AND thirsty! 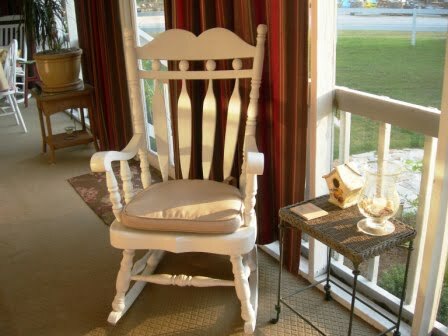 What a wonderful porch and I love those curtains and the accent colors throughout the room…what a great place to relax. I love how you made group seating in both areas…I bet it’s a cozy place to entertain. 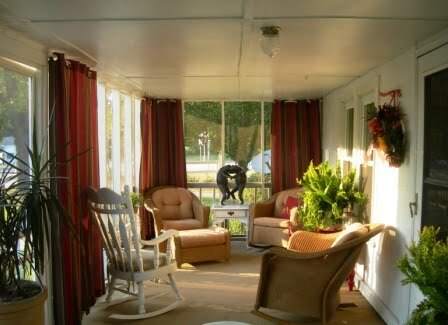 That’s the one thing our house is really lacking…a screened in porch. 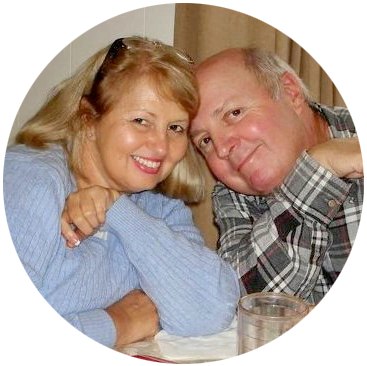 I overheard my hubby telling someone that he was going to put a screened porch on the house this year…we’ll see what happens 😉 Thank you for sharing your porch with us…I love it! Wow, how perfect is that?! I love your porch. The drapes are just wonderful! 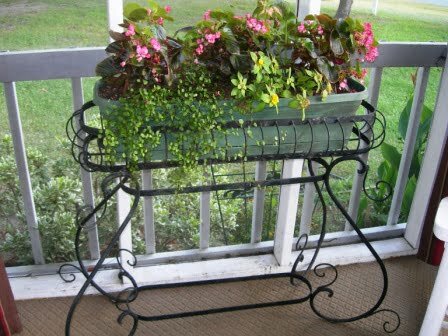 I like the larger planter that you mentioned and I love, love ivy, too. I remember seeing petticoat ferns around here years ago, but I haven’t seen any in I don’t know how long. Wish I had some watermelon…..
Jane I am interested in the book. Love the picture of her home. Who wouldn’t love to have a house built by Frank Lloyd Wright. I have admired his work for years. Wow! I love all the changes you’ve made on your porch. I think the curtains are great and they will fade beautifully! Your trip to Savannah looks luscious! You have a beautiful porch! 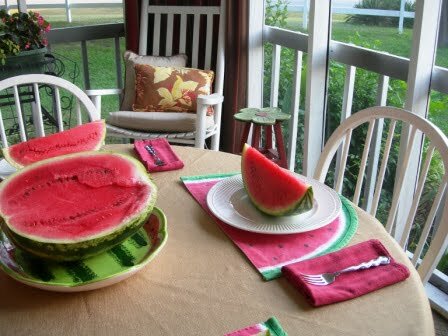 I LOVE your cushions, your cute dog and kitty and watermelon is my favorite!!! That is also an adorable wreath and I love your door painted red. It is so inviting. I am your newest follower. Thank you for visiting me and for the comment. with all of us. Can’t wait to see what’s next! 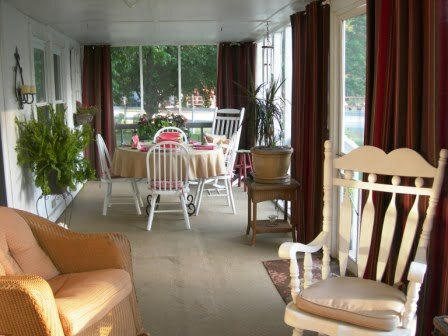 Jane, your screened in porch looks like a terrific spot to spend time. How nice that it runs the width of your home with plenty of room for a sitting area and eating space. That watermelon looks delicious too! 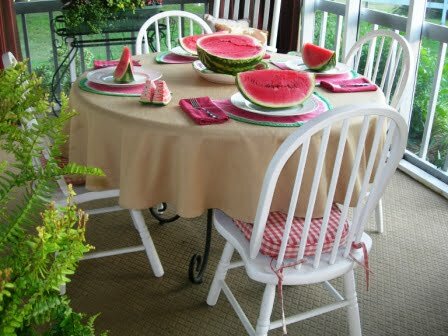 Cute table setting. Just a really fun and happy place to spend some summer time. And adding watermelon, just made it a little bit sweeter. 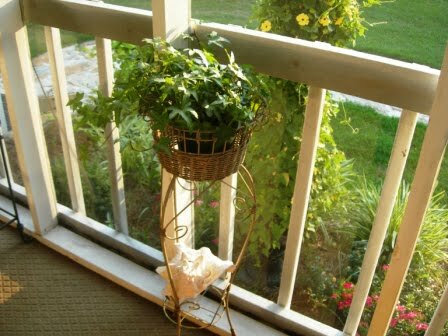 Your porch looks wonderful Jane! Love your drapes~ what a bargain price too! Our porch at the lake is L shaped and the section by our kitchen faces west. We found some UV filtering shades from Lowes that we can pull down and still see out, but they are not attractive to look at…love yours & your red accents! Lovely porch Jane! It looks really warm and inviting – just like you! Jane, your front porch is wonderful! I would love a screened porch. Hi Jane! I want to come and sit a spell. I love porches! I really love your areas on your porch, too. It really creates a multi function room. I’m working on our screened porch; however, the weather has slowed me down. Watch for a post on it as soon as this rain stops blowing through! Thanks for the fun visit. I love your porch. My advice would be to keep the storm door. We took ours down last year when we got a new door and I have missed it so much. I did not realize how much I enjoyed having the door open. Our new door has a long window in it, but on housecleaning day there is nothing like letting more light in. Plus, the dogs miss sitting in front of it. What a beautiful place to sit and enjoy the outdoors without having all of the bugs! Great job! Looks like I’m just in time for watermelon! Your porch is wonderful! Love the color scheme. Everything looks lovely! I am craving watermelon…and I then I see your blog. Oh my! Love everything you did with your porch. Just lovely. Love the curtains. You couldn’t pass up a bargain like that for sure! I’m your newest Follower! 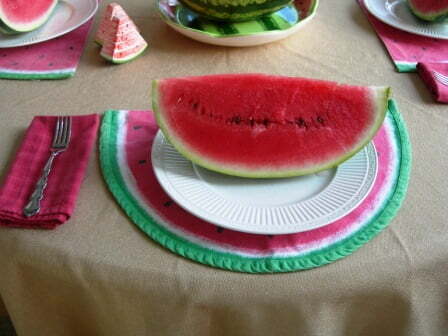 oh this is all so lovely, and I love watermelon! I just love your porch!!! How cool you can eat out there w/o the bugs! I got my banner rug from ebay sold by collections etc. I think it was $13 with free shipping! Take care Miss Jane! I’m lovin Pesky! The porch is beautiful. I will be there for watermellon soon. 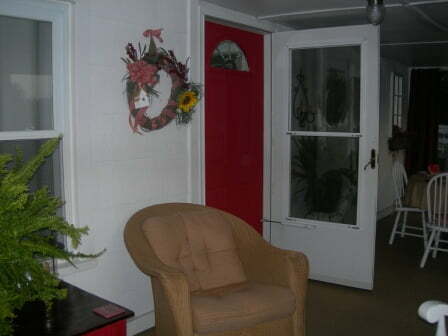 Your very large porch is so inviting and I love all the red touches. Also your pets are adorable. What a beautiful porch! You’ve truly made it an extension of your home. I love the panels, which create such warmth … and, the bird pillows are so cute (admittedly, I have the same ones in green)! 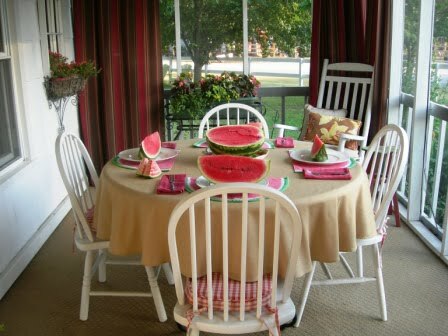 Love your rockers … and, I’m on my way over to sit at your *sweet* (no pun intended, lol) tablscape and enjoy that yummy watermelon! Jane, what a nice porch. I love the drapes. Yes, I will share where those are from later today. Hi Jane, I really love your porch. I think Lucy is very cute. I need those bird pillows!